Michael John Myers, commonly known as Mike Myers, is a famous Canadian comedian, film producer, voice actor, as well as an actor. To the majority of people, Mike Myers is perhaps best known for playing the role of Austin Powers in the “Austin Powers” film series. The first installment of the series entitled “Austin Powers: International Man of Mystery” came out in 1997, and featured a cast of Elizabeth Hurley, Michael York, and Mimi Rogers. The movie turned out to be a moderate box office success at the time, grossing slightly more than $67 million worldwide. However, over the years, the film reached the status of a hit classic, and once again enjoyed popularity among its viewers. This perhaps was the main reason for the release of two more sequels, namely “Austin Powers: The Spy that Shagged Me” and “Austin Powers in Goldmember”. Both of the movies turned out to be box office hits, as they grossed $312 million and $297 million respectively. Even though the two sequels enjoyed a larger media attention, critical reviews towards them were rather mixed, while some were even negative. In this aspect, both sequels failed to repeat the critical acclaim of the first film. Nevertheless, the “Austin Powers” series managed to maintain its popularity, and inspire the release of numerous video games, such as “Austin Powers: Welcome to My Underground Lair!” and “Austin Powers Collectible Card Game”. A well-known actor, how rich is Mike Myers? According to sources, Mike Myers’ income in 2003 amounted to $40 million, while in 2004 he added a sum of $10 million from his appearance in the film “Shark 2”. In regards to his total wealth, Mike Myers’ net worth is estimated to be $175 million. 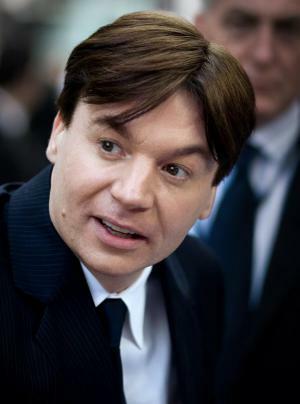 Mike Myers was born in 1963, in Ontario, Canada, where he studied at the Sir John A. Macdonald Collegiate Institute. Myers then continued his studies at Stephen Leacock Collegiate Institute. Upon his graduation, Myers joined the Second City Canadian Touring Company. Shortly afterwards, Myers moved to the United Kingdom, where he co-founded a group of improvisational comedians called “The Comedy Store Players”. Eventually, Myers settled down in Chicago, where he appeared in minor television projects and performed with Second City group on stage. Mike Myers made his first film appearance in a 1992 comedy film called “Wayne’s World”, where he co-starred with Dana Carvey and Rob Lowe. The movie became one of the highest-grossing films of the year, and was even chosen to be featured on a list of “Greatest Comedy Films of All Time”, where it placed at #41. The popularity of the film resulted in the release of its sequel entitled “Wayne’s World 2”, which received just as positive reviews as its predecessor. As Myers’ fame grew, he began to be featured in various film projects, such as “So I Married an Axe Murderer”, “Austin Powers” series and “The Cat in the Hat”. A well-known actor, as well as a comedian, Mike Myers has an estimated net worth of $175 million.